Some 15,000 Messianic Jews currently live in Israel, but if you saw one on the street you would almost certainly fail to recognize any difference. 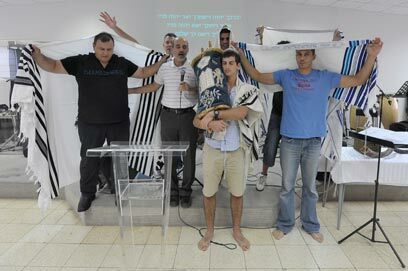 They honor Jewish circumcision, bar-mitzvah, and wedding ceremonies, but believe Jesus is the messiah. The small community of Yad Hashmona, near Jerusalem, is home to a number of Messianic-Jewish families. They believe in Jesus – or Yeshua, as they call him – and in the teachings of the New Testament as well as the old. They are Jews in every sense, but for the most part keep this side of their faith to themselves. When these families gather for the Shabbat meal, however, Jesus is the guest star at their table. Around 350,000 Messianic Jews live in the US, and one would be just as hard-pressed to recognize them there as in Israel. Some are Orthodox, and dress as the haredim do, while others are traditional and wear a yarmulke or no religious symbol at all. They are for the most part Zionists, and see IDF service as a top priority. In the army they serve as pilots, commanders, and elite unit members, but usually make sure to keep their messianic beliefs under wraps. The fact that Jesus was Jewish is generally agreed upon, but what happened after his death is subject to rancorous theological debate. History books tend to recall the first century as a time of rebellion and prophets in Jewish antiquity, and this was also Christianity's first chapter, bringing about pre-historic inter-religious quarreling and anti-Semitism. But in separating between Jews and Christians, history largely ignores the story of those Jewish people who believed Christ was the messiah and continued this tradition well after his death – the ancestors of the Messianic-Jewish faith in modern times. Jonathan Bar-David is a 30-year old Messianic Jew. He attended secular Israeli schools, served as a paratrooper in the IDF, and then went on to travel before settling down to study engineering at the Technion in Haifa. But before all this, he was educated on the teachings of Christ in Yad Hashmona. "When I was little only my closest friends knew I was a believer," he says. "But in high school, when I was ready, I revealed it to my entire class." Bar-David married a non-Jewish member of his community, so according to the halacha his children are not Jewish. He says that if he could he would have them converted, "but the rabbinate will never agree". Bar-David explains how he is able to maintain his faith while living in secular Israeli society. "We don't exactly have secular and religious people (in our community)," he says. "Faith in Yeshua is personal. If you decide to be secular, that's a very significant statement. It's a disconnection. As a child growing up in a messianic family, one of the main missions is to understand that Yeshua is the messiah who came into being according to prophecies in the Torah. We are Jews. The Torah is a basic principle for us." Nevertheless, he says, there are many daily tasks required by the messianic religion. "There are a lot of prayers – before a meal, before traveling, before bed," he explains. "A messianic family has some ten prayers thanking Yeshua the messiah." The Jewish rites, or mitzvahs, Bar-David performs are also plentiful, and do not always conform to those of religious Jews. He doesn't work on Saturday, but can light a fire. He attends prayers at his community and even teaches the Bible to younger members. He fasts on Yom Kippur, but doesn't keep kosher. "Yeshua says human beings need to pay more attention to what comes out of their mouths than what goes in," he explains. "There are those who want to maintain Jewish identity through symbols, but I, like many Israelis, don't feel the need. I am a Jew who lives here, rejoices and laments Jewish and Israeli occurrences. I don't need any proof." Despite his faith, Bar-David adamantly rejects the label of a missionary. But, he says, "Just as God wanted others to know of his glory, I want to tell others about my faith. There is controversy among Messianic Jews about the spreading of our religion, but many do not like the idea of missionaries." Lihi Einav is a 52-year old student of Second Temple Literature at Bar-Ilan. Until the age of 35 she was totally uninterested in religion, and busied herself with the healing profession. But then she met a British couple who gave her a copy of the New Testament, and she was immediately captivated by Christ's powers as a healer. Later she became interested in the Old Testament as well, and her path to Messianic-Judaism became clear. Einav immediately came face-to-face with the lack of female leadership in her newly-acquired faith. But she visits one of the community's centers in Jerusalem once every two weeks. "Faith is more important than religion," says Asher Interter, a 57-year old messianic rabbi in Jerusalem. Interter grew up in a haredi family in Washington, and studied Asian philosophy and religion at Harvard. When he came of age in the '70s, Interter decided to delve into every religion he could think of, "aside from Christianity, which didn't interest me," he says. He finally decided Messianic-Judaism was most suitable for him. Now he performs all of the Jewish Orthodox rites but, he says, as he sees them. Interter perceives Messianic Jews as the followers of first-century Jews who dispersed after the destruction of the second temple, and Christianity as the erroneous development of the messianic faith among non-Jews. "They were wrong and we must now lead the movement to fix this mistake," he says. "It is our global mission." Interter describes a growing population conforming to these values in Israel, with 120 new community members and counting. "The new members are secular people looking for God without the need for rites, or members of the religious population who want to be free but still maintain God's presence in their lives," he says. In Interter's eyes, the prophecy of the messiah came true in 1967, with the Jewish conquering of Jerusalem. "The New Testament talks about the destruction of the temple, a long exile, and finally the return to Zion, and that is exactly what happened," he explains. This may seem a political view to some, but Interter rejects this. "We have no political view," he says. "But we read the Bible and see Jerusalem as our sacred city." This perception leads inevitably to Zionism, and Interter's sons are products of this, having all served in elite army units. For a community living under the perpetual wrath of the haredim, who for the most part alienate and discriminate against them, Messianic Jews remain inexplicably optimistic. Perhaps it is because they still follow in the footsteps of that Galilee-born Jew who wandered into Jerusalem 2,000 years ago, the one who believed in turning the other cheek. See all talkbacks "Jesus lives on in Jerusalem"